Land is in sight! 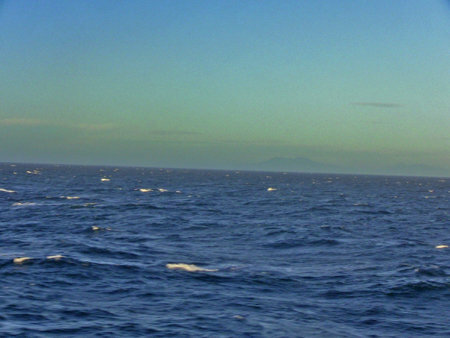 If you look very carefully through the haze in this early morning photo, you can see the coast of New Zealand. We have about 24 more hours to go. During Expedition 329 of the JOIDES Resolution, we drilled many sediment and rock cores. They have been sampled and analyzed and are now sitting in storage containers on the ship.The plastic protective shipping containers are known as “D” tubes because of their shape. They D tubes are packed in cardboard boxes and brought to the refrigerated room until we reach port. They will then be off loaded and shipped to the large refrigerated repository located on the campus of Texas A & M University in College Station, Texas. This is known as the Gulf Coast Repository and is where all cores recovered by the JOIDES Resolution are stored. There are two other repositories, one in Germany and the other in Japan. These hold cores recovered by other ships in the Integrated Ocean Drilling Program. Researchers from all over the world can visit the repositories to examine and sample the cores when needed. Well, this is my final blog of Expedition 329. I have enjoyed the past two months, have learned a lot and I hope you have too. We will be reaching Auckland, New Zealand early tomorrow morning. Have a good day and follow the blogs for Expedition 330!